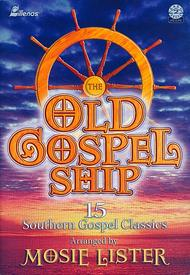 Old Gospel Ship, the, Book (15 Southern Gospel Classics). Composed by Mosie Lister. For SATB choir, or flexible voicing. This edition: Paperback. Choral. Excel Series. Choral collection - songs appropriate for church services, concerts, revivals. Gospel. Songbook. 72 pages. Published by Lillenas Publishing Company (LP.MB-909).ISBN 9780834172098. Gospel. 9x12 inches.Gospel oriented choirs will love The Old Gospel Ship!This collection features 15 songs of testimony, praise and thanksgiving in Easy 2 Excel Flexible format. Mosie Lister originals are joined with some best-loved gospel songs.